Geoff Phillips will soon see the first part of his major grant-funded project come to fruition. He will be hosting The Living Heritage of Maple Creek on Sept. 27, in conjunction with the SW Sask Oldtimers’ Museum. The event, open to the public, is meant to spread awareness of the history of the town and the Cypress Hills through art and culture. “I’m just really excited. This project will teach people community history, and we will do the first workshop about the early history of the Cypress Hills,” said Phillips. The work will be done through a grant from the Saskatchewan Arts Board given to the Oldtimers’ Association for their Artists in Communities project. Connie and Geoff Phillips approached the museum earlier on about partnering to develop a program with Geoff as an artist in residence doing workshops for the public. “Through this partnership, we’ll be specifically working with Main Street Coordinator Royce Pettyjohn on this project. He will be valuable when presenting about the history,” he said. For this first workshop, Phillips hopes to show his topographical map, which will show the Cypress Hills in 3D. “I’m going to be showing the different people and groups who populated the area, and the fact they couldn’t all find room to get what they need. There wasn’t much land or resources,” he said. He is passionate about all the things that were unique to the area, including the Lodgepole pine. It was an area well-used and needed by many. 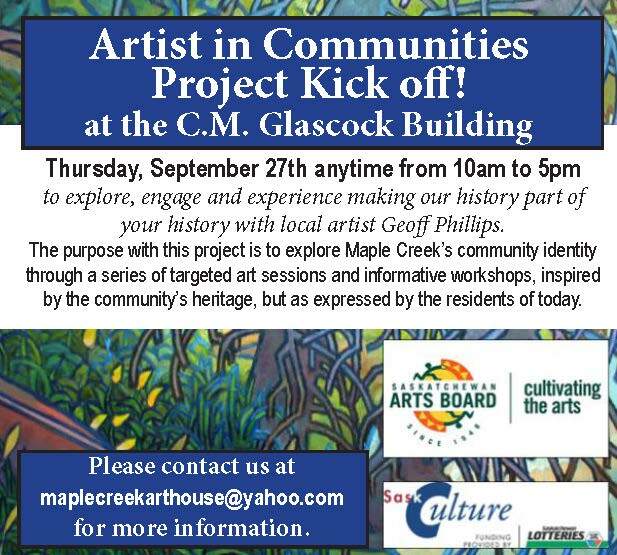 You can visit with Phillips at The Living Heritage of Maple Creek event on Sept. 27, 2018, at the C.M. Glascock Building from 10 a.m. to 5 p.m. It is open to the public.